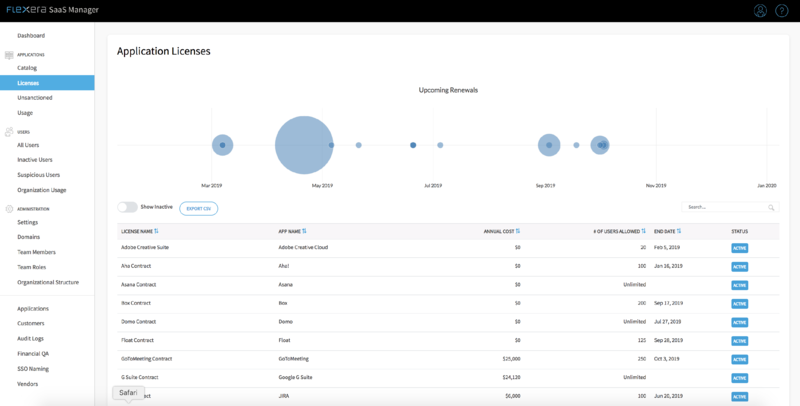 The SaaS Manager Dashboard is a summary screen that shows your apps, users, and unsanctioned spend as well as your active/underutilized/abandoned accounts and upcoming contract renewals. 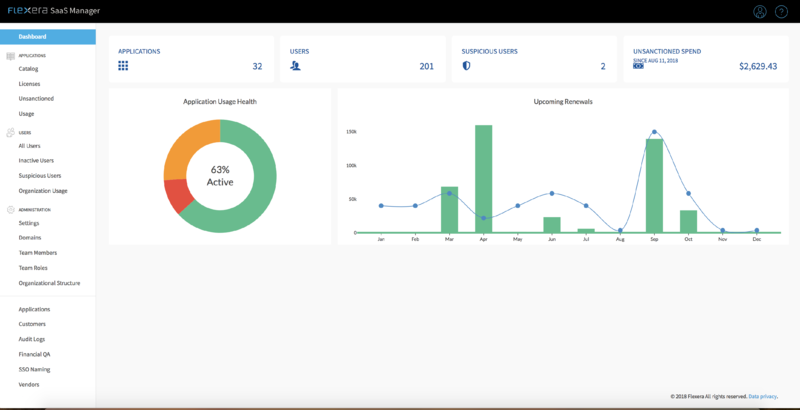 The Licenses screen will display all active contracts based on their renewal date. Each circle coincides with a contract and will vary in size based on its relative annual spend. Licenses that do not have an end date will appear in the contract listings, but will not display in the graph at the top of your screen. 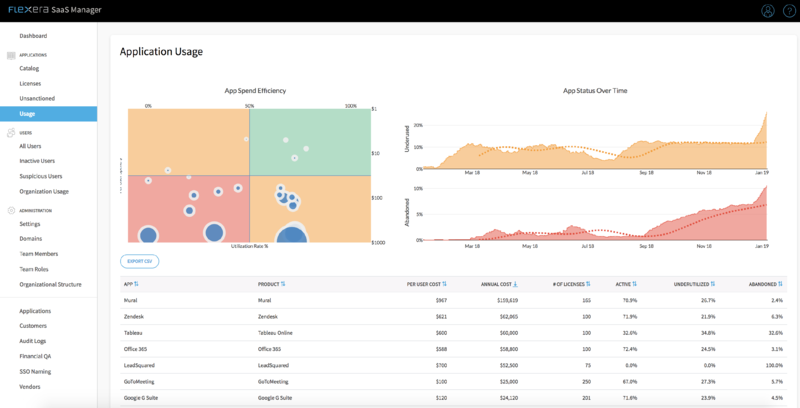 The App Usage display includes reports for (1) App Spend Efficiency and (2) App Status Over Time. The "Unsanctioned SaaS Spend" table only appears when your company has connected an expense/financial software to SaaS Manager. Here you will see all expenses that are or could constitute your SaaS spend. 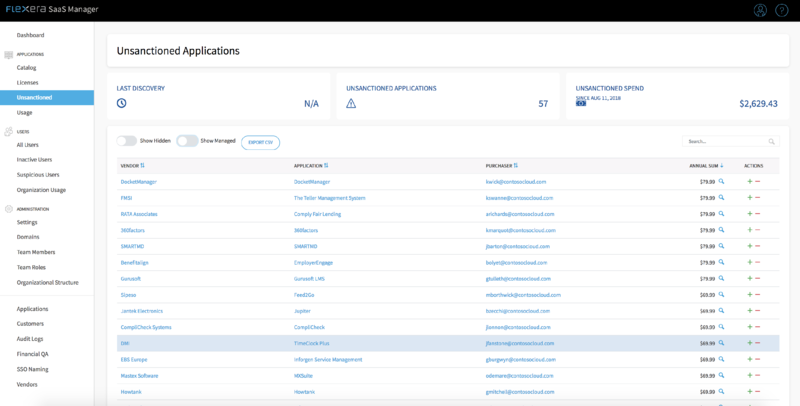 Unsanctioned Apps: Your unsanctioned apps are all "apps" found in your financials that you are not currently managing via the SaaS Manager platform. Unsanctioned Annual Spend: Your unsanctioned annual spend is the total amount spent on those unsanctioned apps. 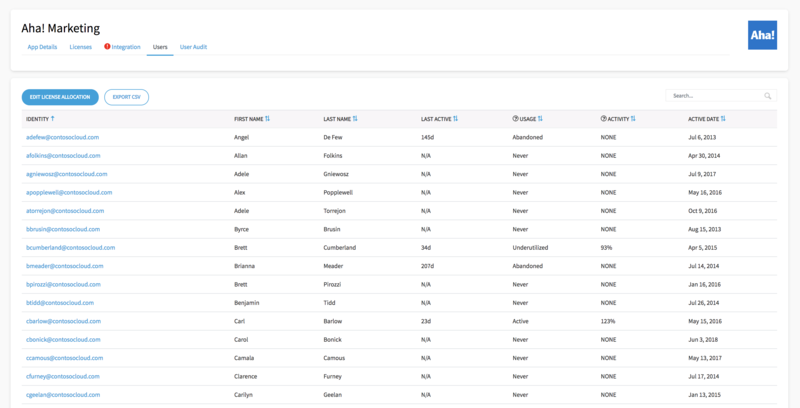 Here you will find an exportable listing/report of all inactive and abandoned users per application across your account. This list will only include applications in which we monitor activity. 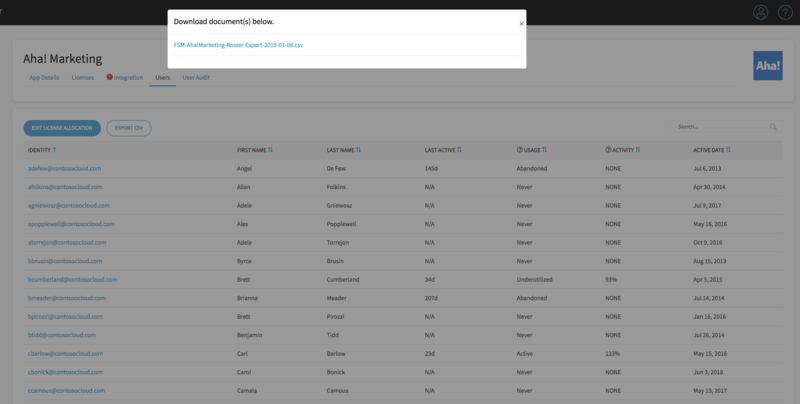 Here you will find an exportable listing/report of all accounts within an application and what the activity categorization is for each. Ex. Are they active, abandoned, etc.? To obtain this data, click on the application you wish to view. Navigate to "Users". 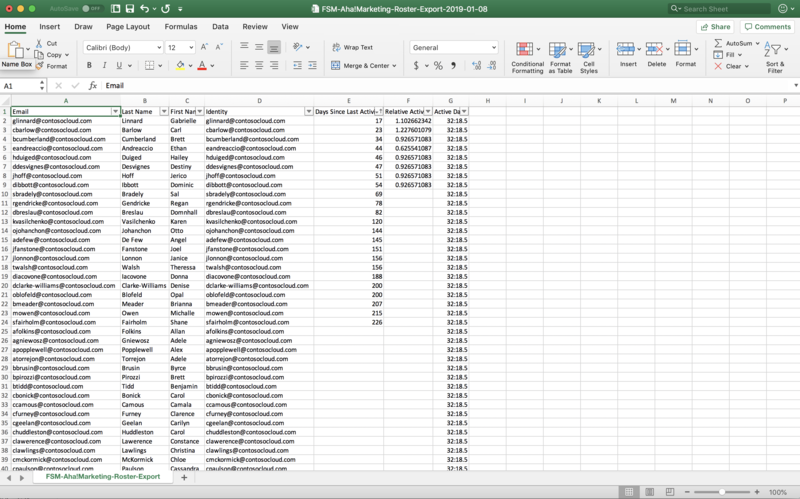 To get a more manipulatable version of this report, click the "Export to .csv" button on the top left. The activity table shows more thorough details of a user's usage patterns over the past 90 days. It details what actions were taken in the application when that particular action occurred, and any notes about said access. 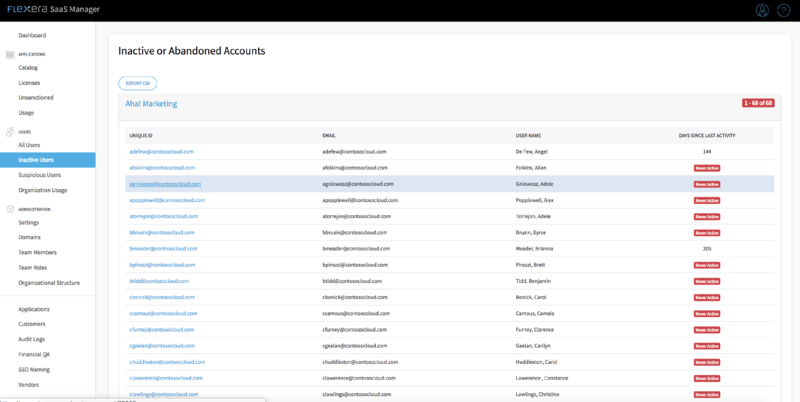 The accesses table details all of the apps a user has licenses for or access to, when their accounts were activated or deactivated and when their last activity was with a particular application.